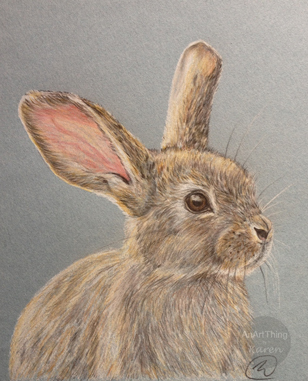 Here he is all finished, Peter the rabbit. Only took a few hours and loved trying out the pastel paper instead of the usual white. Thank you to C Allsebrook for the use of the original photograph. Nice rabbit. I am not a big fan of “still life” art without some other “pizazz” or humor thrown in. But, you captured the animal well. Pastel paper? I have not seen this. I have seen various grades of thickness and texture. But, not colored drawing paper…unless it’s that faintly tinted “comic book” board.